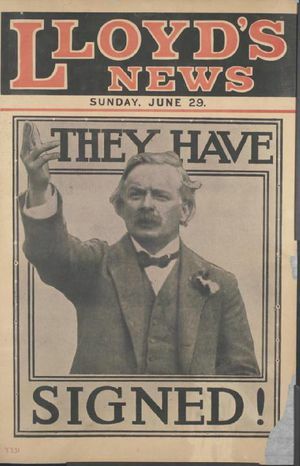 Lloyd's News reporting the signing of the Treaty of Versailles on June 28, 1919. The guns fell silent on the eleventh hour of the eleventh day of the eleventh month of 1918. Over four years of incredible destruction came to a silent end. For the belligerent Central and Allied Powers, the armistice brought uncertainty. The Kaiser had just been overthrown, and a new alliance of Liberals and Socialists announced a democratic regime at Weimar, Germany. The other Central Powers had collapsed in disarray and revolution. Russia, out of the war in early 1918 was in the midst of a deepening Civil War. Many of the Allies were exhausted and drained. The delegates that crafted the treaty that ended the First World War believed that they had brought lasting peace to Europe. President Wilson felt that the war had made much of the world safe for democracy to spread. However, conflicting goals, the harsh terms of the treaty and Germany’s response to those terms would lead to the most destructive conflict in world history - World War Two. Georges Clemenceau and Woodrow Wilson at the Formal Signing of the Treaty. 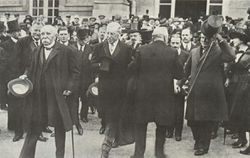 The delegates of the victorious powers met in Paris to discuss the terms of the peace, followed by the treaty's signing at the former French royal palace of Versailles. Led by the "Big Four," the U.S., France, Italy, and Great Britain. Each had their own goals and vulnerabilities. While the U.S. President Wilson adhered to an idealistic view of collective responsibility and ethnic self-determination, France was driven largely by one thing: revenge. France sought to avenge its humiliating loss almost fifty years earlier in the Franco-Prussian War that resulted in a united Germany. Each of the powers represented at the treaty conference came out with some disappointments. The British goal of stability was largely subverted by revolutions across Europe and France's demand for increasing punishment for Germany. Italy did not receive territory promised in secret deliberations during the war. The largest shortfalls appeared for France and the United States. However, it was France that had the most significant impact. France's constant desire for revenge alienated its allies and sparked radical political movements in Germany. The French understood that Germany was utterly drained by the war, losing almost half of its youngest adult male generation. Paris developed a decidedly defensive posture, seeking various ways to box in and humiliate Germany. France created alliances with many of the new Eastern European states, none of which would adequately function. France also produced a long line of defenses along the new Franco-German border. This Maginot Line proved to be less than up to the task in 1940, despite substantial effort and investment. 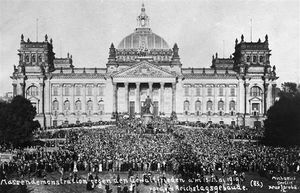 Mass Demonstration against the Treaty of Versailles at the Reichstag in 1919. Naturally, Germany was less than thrilled about their situation. By November 1918 nary a square mile was under Allied occupation, and the Kaiser's troops still occupied a substantial part of Belgium. German propaganda had been announcing for months that their soldiers were very close to victory through much of 1918. And in many ways, they had been. The shock of defeat coupled with the harsh terms proposed carved an indelible mark in the German psyche. This unexpected defeat led to the famous "stab in the back" theory that was utilized by Hitler. The sight of American, British, French, and Belgian occupying the Rhineland pierced the brief calm after the fighting ended. Versailles hung heavily on the German consciousness immediately. Various political parties, especially on the emerging far right desperately campaigned against the terms. Furthermore, armed militias often called the Stahlhelm (Steel Helmets) organized across the country burnished by Great War veterans and armaments. This militia helped lead to further undermine the unstable Weimar government, already accused by many on the right of being born on the corpse of the empire. A bizarre combination of the new political party combined with militias led to emerging Communist and National Socialist conflict. Rather than foster long term peace and stability, the Versailles Treaty's main goal of handling Germany instead sparked movements that would lead directly into World War II. The National Socialist Party used widespread anger about Versailles with the economic collapse of the Great Depression to come to power in 1933. Six years later the world was again at war, this time far more destructive and incorporating widespread genocide. The inability for Wilson's ideals to come to widespread fruition led to further devolving situations in Eastern Europe and Asia also allowed for Soviet and Japanese expansionism. Far from preventing another war, in many ways Versailles instead caused another one. ↑ Roekmeke, Feldman, and Glaser, Editors. The Treaty of Versailles: A Reassessment after 75 Years, (New York: Cambridge University Press, 1997. Page 90. ↑ Roekmeke, Reassessment, Page 45. ↑ Sharp, Alan. The Versailles Settlement (New York: Palgrave MacMillan, Second Edition, 2008. Page 132-133. 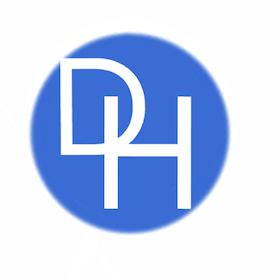 This page was last edited on 18 January 2019, at 23:04.